The Novation LaunchKey Mini MK2 is the all-new MK2 version of Novation’s most compact and portable MIDI keyboard controller. Featuring 25 mini synth-action keys and 16 velocity-sensitive pads, along with Ableton Live Lite, Novation’s Bass Station software synth and more, this lightweight but powerful DAW controller makes the perfect addition to any electronic performance or studio setup. 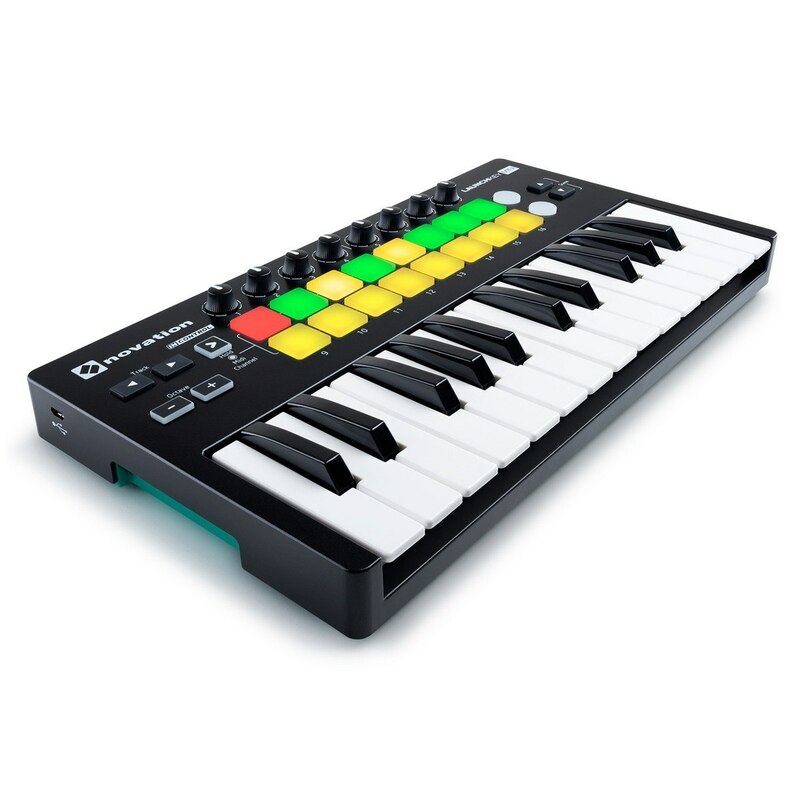 LaunchKey Mini has been designed to make it easy and fun to produce electronic music. All the controls work as soon as you plug it in; arranged to make the most sense in Ableton Live. 16 velocity-sensitive pads let you launch clips and play beats. They light up to show you when clips are loaded, playing and recorded and are laid out to match your Ableton Live session view; one row to launch clips, and one row to stop them. You can also easily tweak your instruments using eight high-quality knobs, and sketch out ideas on a 25-note mini keyboard with a fast synth-style action that makes it really nice to play. LaunchKey Mini is compact and tough enough to throw in your bag, so you can take it anywhere. Fully class compliant and bus-powered via USB, it is also ready to use the moment you plug it into your laptop, with no need for any drivers or power cables. You can also connect it to your iPad via a Camera Connection Kit to control all sorts of iOS music apps, like Novation’s free LaunchKey App. LaunchKey Mini also integrates immediately with FL Studio, Pro Tools, Reason, Cubase and Logic without any mapping whatsoever. It comes with everything you need to start making music, including Ableton Live Lite, Novation Bass Station and V-Station virtual instruments, and 1GB of samples from Loopmasters. Designed for Ableton Live: All the controls are laid out intuitively and work immediately. Play Loops and Create Expressive Beats: Trigger clips and play drums using 16 velocity-sensitive multi-coloured pads. Shape Your Sound: Tweak your instruments and effects or freely re-assign using eight high-quality knobs. 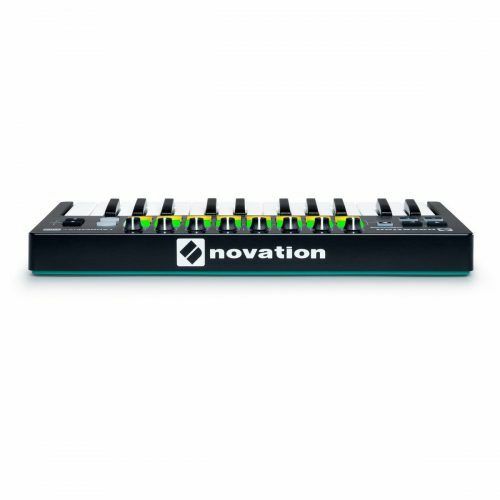 Easily Produce and Perform: 25-note velocity-sensitive mini keyboard, with fast synth-style action. Take it Anywhere: Compact and tough enough to throw in your bag. No power cable needed. Control All Major Music Software: Get automatic hands-on control of other DAWs, including FL Studio. Plug In and Play: USB bus-powered and totally class-compliant, so it works straight away without any drivers. Make Music Immediately: Includes Ableton Live Lite, Novation Bass Station and V Station virtual instruments plus 1 GB of Loopmasters samples. 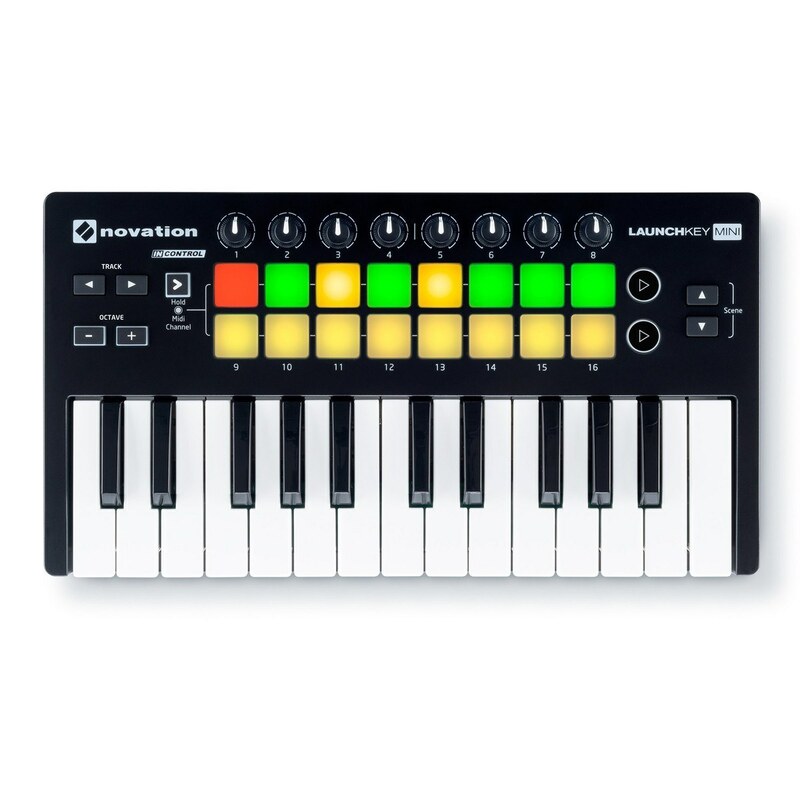 -If you already have Ableton Live it must be version 9 or -greater to work with Launchkey Mini. We recommend that you update to the latest version as previous versions of Ableton Live do not include the Launchkey Mini integration for InControl. Launchkey Mini will also work as a standard MIDI controller.